I have been looking forward to obtaining this new set of Napoleonic rules for almost a year. They were written by David Brown, the author of the well regarded General de Brigade ruleset, and they come from TFL's Reisswitz Press. I have never played GdB, so I really had no specific expectation of the ruleset. I have gone through several rulesets, including Le Feu Sacre, Field of Battle, Republic to Empire, Black Powder, Lasalle, Rank & File and none really sat well with me. They were either too complicated or just boring as they really had weak Command and Control. After playing Chain of Command, I have found rulesets with poor or no C&C really just not that interesting. Any one can push figures about and throw dice but I want a game with some high level decision making. 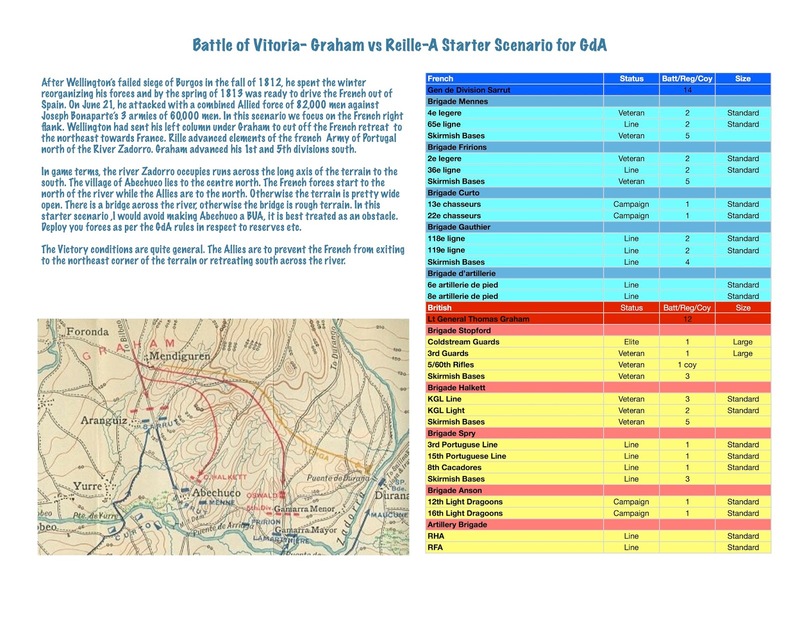 The rules are written at both the tactical and grand tactical command levels. The smallest game would be a Division aside with 5 brigades at the minimum. A large game would be at the Corps level with 2-4 Divisions per side. Basing: is agnostic, although it is recommended that both sides be based similarly. Infantry, Cavalry and Artillery units are designated as Large, Standard or Small and are graded as Elite, Veteran, Line or Recruit. Command bases with C&C, Brigadiers are recommended as well as some skirmish bases. Attrition: is measured using a method of accumulated casualties. 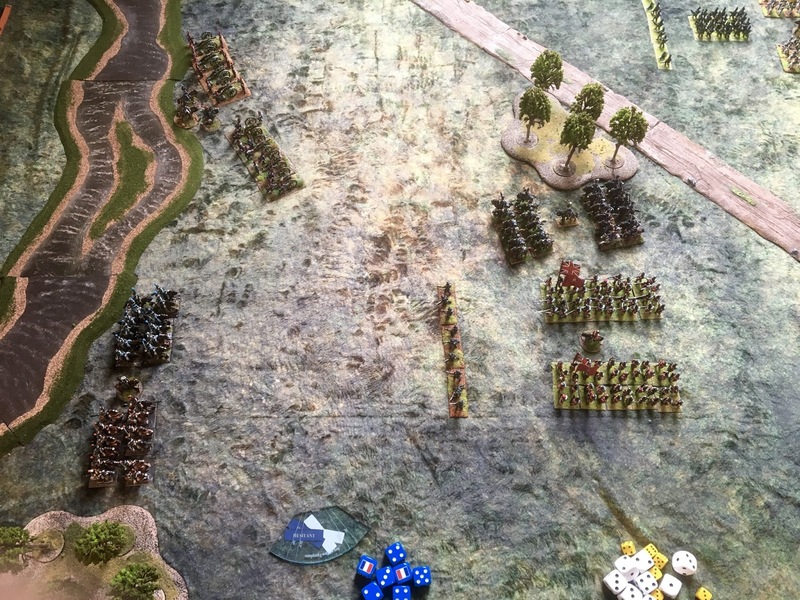 A unit accumulates casualties by being fired upon, charged or in melee. Units have a graded loss of effectiveness according to their size and type as well as the number of casualties. There is no stand removal, at a certain point the unit is dispersed and is just removed from the game. 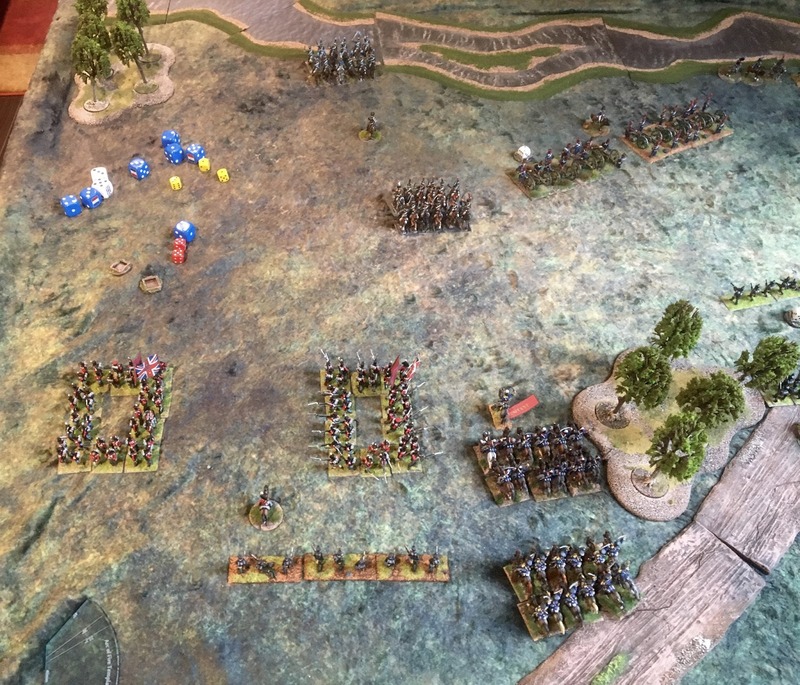 Order of Play: is Command, Charge, Movement, Firing and Melee. C&C: is really the sterling feature of this ruleset. each side has a number of ADC's equal to the number of Brigades (there is some variation on this if needed). The turn begins with a dice roll to see how many of these ADC's are available for this specific phase. 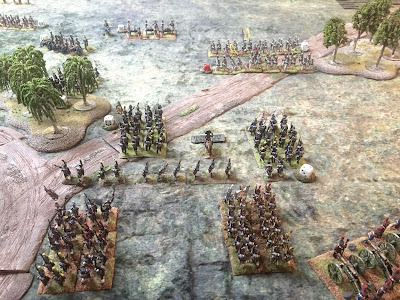 ADC's have multiple uses, they can be used as a Brigade Attachment to insure that a specific brigade will obey orders in a turn, they can be used to coordinate a specific attack, they can increase movement or firepower or to incite a commander into a glorious maneuver to name a few. Once these tasking are applied, each player dices for each brigade to see if they will follow orders or become hesitant. Finally both sides dice for initiative to see who goes first. Movement: is fixed for specific unit types, in most cases you maneuver or move although standard sized elite units as well as Horse Artillery can do both. You can still fire if you have moved but at a reduced fire power. Movement, maneuver and interpenetration are all dealt with quite simply and after a couple of turns you do not even need to refer to the QRS. Movement is alternative and follows the declaration and resolution of charges. Charges, Firing and Melee: Are also quite simple. The charge is sequential with each side declaring charges followed by each side carrying out the charge. There is an opportunity for a Charge Reaction. Charge resolution is quite simple, both sides throw 2d6, modified by several easily remembered factors. The pips are tallied up and the difference between each side is applied to the Charge Result Table. Either the charge fails, one side retreats or routs or a melee ensues. Firing is similar but only one side throws 2d6, followed by the other side. The player with the initiative has the advantage because of this. Again there are modifiers and a Firing Resolution Table is utilized. Melee is the last step in a turn, here each side throws a fixed number of dice which is again modified by a number of factors and the results are applied to a Melee Resolution Table. Morale: In each turn a brigade starts out as being Steady or Hesitant, Hesitant brigades can not charge or move forward and have limited fire power. As a result of combat, Brigades can also Falter and as they lose units they become Demoralized. 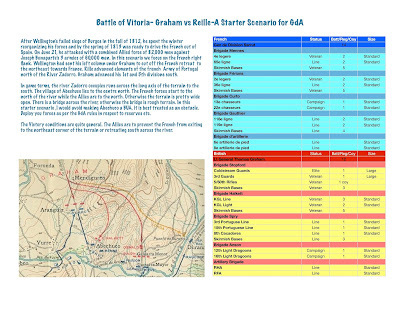 To test the rules, I put together a small scenario based on one part of the Battle of Vitoria, as laid out above. This was a solo venture which is somewhat difficult as you have no-one to bounce questions off. The author though has been readily available on the TFL forum and has been answering questions quite quickly. As usual blogger screwed up the order of the photos so they are all jumbled but I think they give you some sense of the game. British starting position in the foreground with the French just this side of the river. 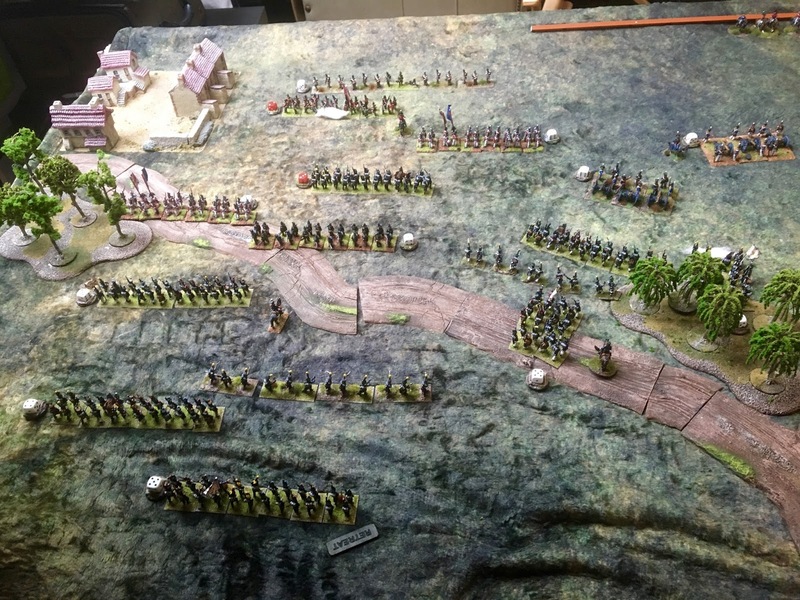 Near the end of the game, the French are using an Infantry Assault Order to pummel the British Artillery. The British Artillery position covering the French advance with the Portuguese holding their left flank. 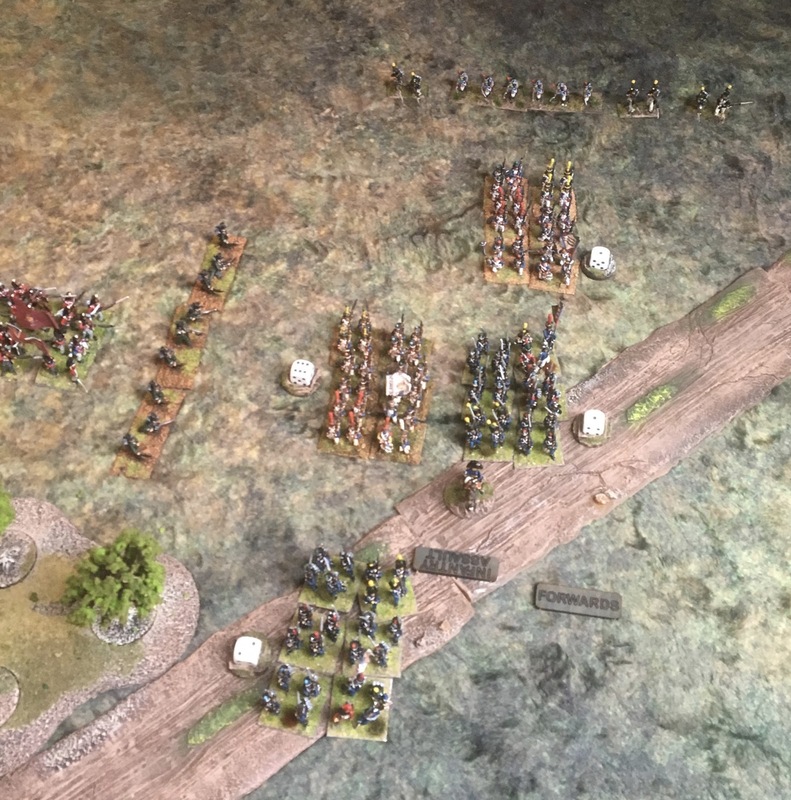 The French off table reserves were bought on in the centre once the Portuguese were weakened , they immediately went on a Assault order allowing them to launch a combined assault with supports. 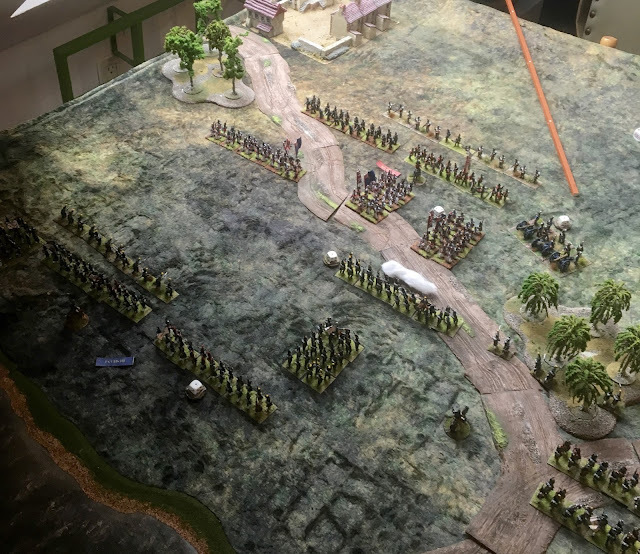 Near the end of the game, the French right flank that was held by 2 cavalry regiments against an elite brigade of British Guards as well as a light dragoon brigade. The French left flank early in the game, they are advancing against a KGL Brigade. 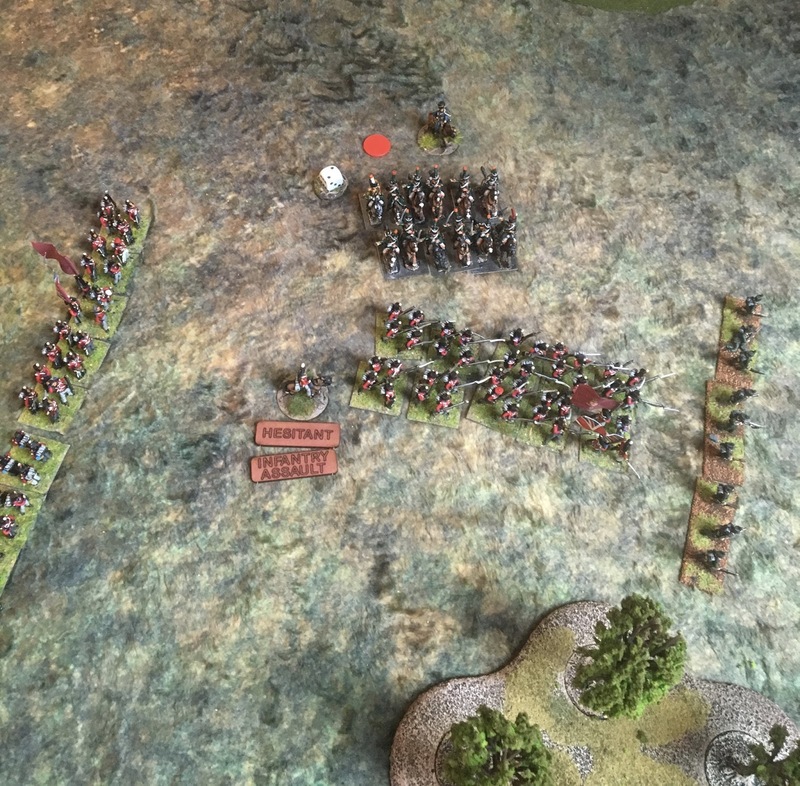 British Guard Brigade attempting to flank the French Infantry Assault, they bottled it on their command roll and hesitated allowing the Chasseur unit to charge into their flank. The British Guards skulking in square. It is too bad that the photos are all out of order but this was really not meant to be an Action report. By the end of 12 turns the French had clearly won, both side had lost their artillery and half their cavalry but the British were down to 5 battalions while the French still had 10. This is a great ruleset, I found it a lot of fun but also challenging. The rulebook is well written and well laid out. I had no problems figuring where things were. Most importantly the gaming mechanisms are quite simple and easily learned. Mr Brown has scored a winner here. I look forward to many more games.